Why can't a PDF just be placed without option to edit? Not sure why Affinity is so insistent on having us edit PDF's in Publisher. PDF's can be a nightmare to edit at the best of times when not using the right software to rip it apart and now they are trying to do this with a page layout program? How can I place a PDF without it making every bit something I can edit??? Sometimes you just want to place a PDF and not have that, well I would say most times I want to be able to just drop a PDF in and not edit it. Seriously, this is something that would be more functional and useful in Designer/Illustrator or directly in Acrobat DC. It is not needed and I for-see it causing more headaches then it is worth to be able to edit a PDF right in Publisher. At the very least give an option to simply place a PDF without the option to edit it in the software. Maybe it is there and I have missed it, I tried clicking various things in the dialogue box that only seems to come up when I drag and drop a PDF outside of the document page. Placing a PDF through file>place does not bring up the dialogue box and directly dropping the PDF inside the page itself does not bring up a dialogue box. Guessing that is a glitch. Does't the PDF show up as a layer? Can't you just lock the layer? Go to menu File ▸ Place..., select the PDF file from the dialog that will open and click (or drag) to place it in your document as an embedded document (note the label after the layer's name in the Layers panel). You can still edit it if you want, selecting the embedded document layer (with the Move Tool) and clicking the Edit Document button in the context toolbar. This will open the PDF in a new document tab ready to be edited. Make your changes and close this document tab - the original document where the embedded file is will be updated accordingly. Go to menu File ▸ Place..., select the PDF file from the dialog that will open and click (or drag) to place it in your document as an embedded document (note the label after the layer's name in the Layers panel). You can still edit it if you want, selecting the embedded document layer (with the Move Tool) and clicking the Edit Document button in the context toolbar. This will open the PDF in a new document tab ready to be edited. Make your changes and close this document tab -the original document where the embedded file is will be updated accordingly. Ok I see now that it is opening the PDF in a new tab. Have to say that needs some work as the tabs do not stand out at all, had no clue it even had tabbed documents. Would be nice to turn that feature off completely, an accidentally double click and I am in edit mode. And this is no substitute for pdf pass through. A subsequent pdf made using place dies not retain original fonts. I personally think they should scrap the whole notion of editing PDF's in Publisher. Serif added pdf pass through in the Plus line. It will be added eventually to the Affinity products. But there are a whole BIG BUNCH of us who very much want to be able to edit a pdf. We are extremely grateful for this wonderful feature in Publisher. Why don’t you just print your pdf’s straight from Preview (if you are on a Mac) and then close the documents? But please don’t ask the Affinities to take away this wonderful option from the rest of us! My test project here is to take a design produced by a colleague (actually, he's now an ex-colleague) and this is only available as a PDF. I find it really convenient to be able to open the PDF directly in Publisher and "take measurements" from various elements to then rebuild his design natively in Publisher. So I'm not actually editing the PDF (in fact, it's opened in a separate document from my project file), but couldn't do this as easily if we lost this functionality. Place PDF doesn't place a PDF - it tries to convert everything to editable format. That means missing fonts will be substituted without warning and the whole thing is asking for trouble. At the very least there should be a warning about this when you try to place a PDF. When you try to open a PDF you do get a warning about missing fonts - should be the same when placing a PDF. I love the way Affinity designer can open and edit PDFs much much better than Illustrator, it actually produces something I can work from. I hope they mantain this as it is a strong point of the software. However, I do think there should be more advanced options when placing images, like indesign offers. It should enable me to pick a page or an artboard, give me cropping option and also give me options to edit the pdf or place only a preview which will remain as is. Editing PDF's can be a nightmare. I am all for editing a PDF in the right place. Trying to get a page layout program to also properly rip apart a PDF and make it editable is scary. Programs like Illustrator/Designer are going to have far more options to do this when PDF's are complex. Currently Publisher has trouble even placing a PDF without messing things up (from my experience with PDF's made from Word and placed in Publisher). Priority should be on that and not making a PDF editor. I get people wanting this, it has been something people have been asking for for a long time. Again I do not think a page layout program is the best place for this, trying to be too much while ignoring features that are an absolute MUST for any pro page layout software (data merge being one). I do agree with postmadesign that they at least need to have more advanced options when placing a PDF, and even a way to turn this feature off completely. The focus should be on different things at the moment to get a good solid base. People have had trouble editing PDF's for a very long time and I seriously doubt Affinity is going to solve that. They have software that can rip apart a PDF already and let you edit it. Designer would be a much better place to focus this on in my opinion to edit pages of a PDF. Editing PDFs and placing/importing PDFs are two completely different things. If a customer provides a PDF which needs to be included as part of a new design then the ability to place and crop a page from a PDF file is pretty important. But this must be done as a pass through and NOT as a converted graphic. It needs to be 100% reliable and I hope Serif take this onboard. Having said that, the ability to convert a relatively simple PDF into a page layout program can be really useful at times. People sometimes bring me MS Publisher files to be tweaked and I'd much rather make a PDF and then edit it in AD or APub than use MS Publisher for that. Its horses for courses. Part of it is a workflow thing. I prefer making the changes to the PDF itself and not edit the PDF in a program that I am saving it with those changes. This really is embedded vs linked. I can have a PDF that needs to be used in a few different jobs, so rather then copy from a Publisher file into a new Publisher file the changes would have been done with the PDF that is to be linked. All changes done now for anything I am using it with. So opposite of you I would like to make changes to the actual PDF, save it, then place it. Unless of course I missed something where Publisher will also resave the edited PDF as well. Microsoft is horrible with PDF's though I find Adobe handles them pretty well, I rarely have issues with them other then trying to fix the customers file to make it work for print (i.e. bleeds, fold position, etc). Being able to edit a PDF in Publisher is very useful for many of us. If someone doesn't want to edit it... well just don't edit it, but don't ask to remove this function. If you just "place" the PDF (using the Place Image tool) it just put it where you want it, the size you want it to be and fonts are not replaced. So we have the best of both worlds. I agree workflows are all a bit different and sometimes changing the pdf directly is best. I don't think that embedded vs linked is the issue with APub for pdf files. With InDesign pdf files can be linked or embedded and either way they will usually print fine or have a new pdf made fine. And a linked pdf can be embedded and an embedded pdf can be unembedded to make it linked. There is nothing like that in APub. Even if "prefer linked" is chosen, a placed PDF isn't really placed - it's converted, usually badly if fonts are missing. There just need to be a way to use the original pdf file and not an interpreted version of it. That doesn't work for me. Have you tried making a pdf with a particular font, then removing the font? When I do that the text in the placed pdf uses a different font to what it should be. So if I place someone else's pdf the fonts are likely to be wrong. To illustrate the point, even a placed PDF is technically being edited in APub (and the others). In the next screen shot, I have placed the Q PDF into APub. 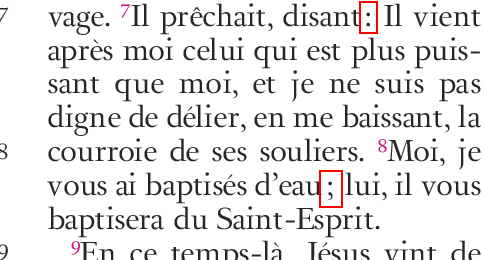 Because a PDF has zero idea about OpenType features, it is displaying colons on each side of the non-breaking spaces. As well, the end of story marker is being displayed, showing that even placed PDFs are being "touched." And when I export this APub file with that placed PDF, those colons on each side of the non-breaking spaces are exported to the APub PDF. I didn't realise there might be a problem even if the fonts were installed. As you say - pdf pass through is a must for handling pdf's well. Yes, we definately need pdf-passthrough, which is reliable and does not create the problems shown above. Perhaps publisher should simply distinguish between opening a pdf, which makes it editable, or place it into an existing file as is, without the ability to edit. +1 for placing pdf as is, or another option to edit. I did not really understand this discussion at first, because to me, it appeared like APub was both able to import pdf (and edit them) as well as place them as untouched, not editable embedded documents (i.e. in picture frames). But currently, the later is not totally true. 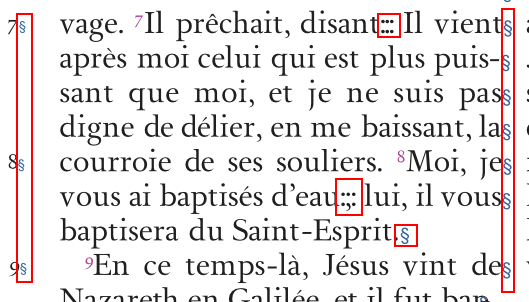 As @MickRose mentioned above, if the embedded pdf document has missing fonts (on your current system), these will silently be replaced with something else (and no options to fix that). @MikeW showed another related issue. This is not optimal, I would say. If "pdf-passthrough" is the terminology for embedding untouched pdf documents, pdf-passthrough we need. Sometimes you make a publication where most is your own artwork, but on a few pages are "Ads, or Sponsors-Pages" coming from another design-bureau (made with another system and fonts), and you absolutely have no right to change anything in these files. This is very true and both cases are needed. Though, many of us think that handling a PDF is a simple thing – after all it is selfcontained file that display and prints anywhere. Surely there must be some PDF toolkit library that allows handling it as an object? I looked into this and this is not the case. Codewise passthrough PDF is just as hard a case as opening and editing it. That is why passthrough PDF is late coming.